PLEASE NOTE: I have for over a year now placed these three short “notifications” at the bottom of each page! It is now obvious to me the general public never gets that far before wanting to ask me a question on beer stein dollar values. So I have had to move them forward as I am getting tired of copying them and sending them back to people as an answer to their “stein value” questions. This was meant to be an informational web site only. 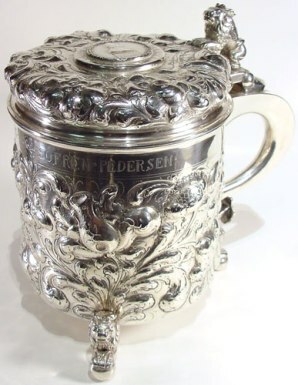 Go to the web site for “Stein Collector’s International” and click on “Stein Talk,” someone there might help you. I just do not have the time. My site has its own search engine [top right on each page!] SO if one puts in “Wood Steins” or “Hand painted steins,” it will give one a list of all the pages that has that subject matter within it. 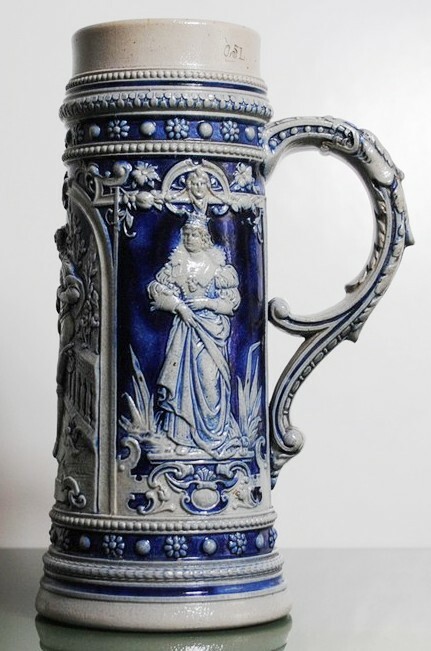 Although I’ve been collecting beer steins, tankards, beakers, pokals, and other drinking vessels for over 40 years now, there is still a wealth of information that other people have that I or the collecting masses do not. Therefore this web-site and also this informational page. Anyone with even the slightest information on any of the listed questions is asked to drop me an email at [email protected]. No possible “answer” will be made fun of, I can assure you. 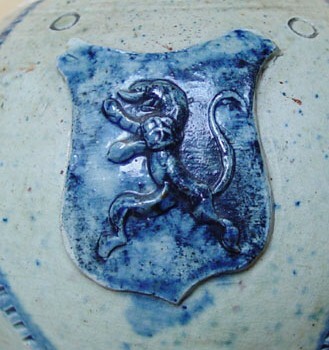 What does “the lion holding the ball” as a thumblift mean? 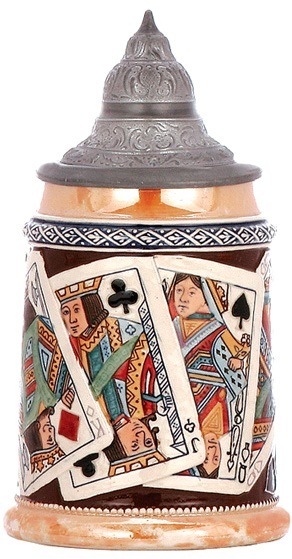 These are seen on northern German (Baltic) steins and Scandinavian wooden and silver pieces. 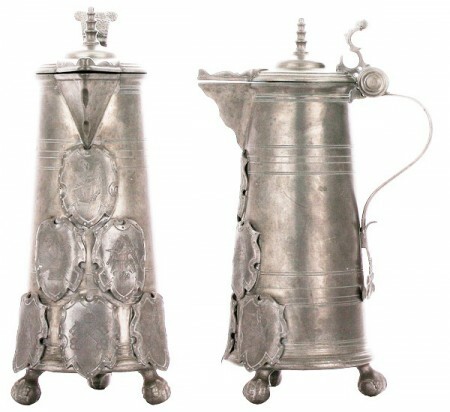 Shown: Pewter roerken, dated 1715, from Lubeck, Germany. Scandinavian, wood, Circa 1750. The ball is very small between his paws. 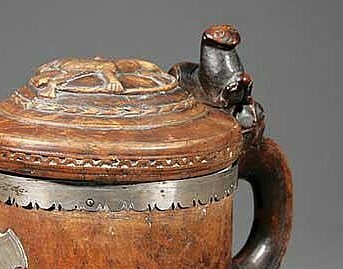 Again Scandinavian, a silver stein with lion and ball feet. 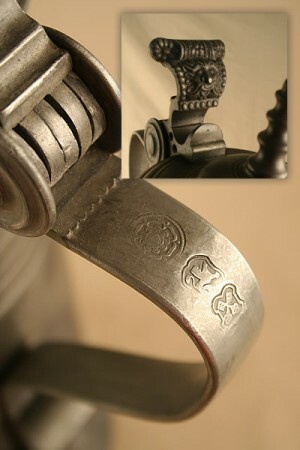 Also found on the pewter roerken pictured above is this symbol. 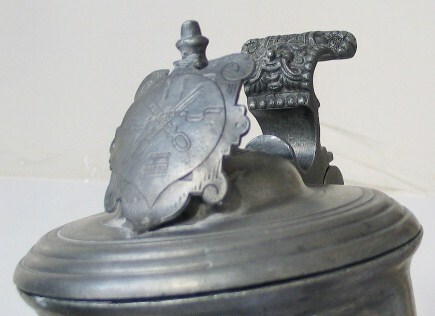 Symbols were used to indicate other things, in this case the symbol for the Guild that used these steins. I have tried to find this symbol everywhere in the last 6 months. I am leaning towards this having something to do with an early weaving too, but = ? Any additional information would be appreciated. 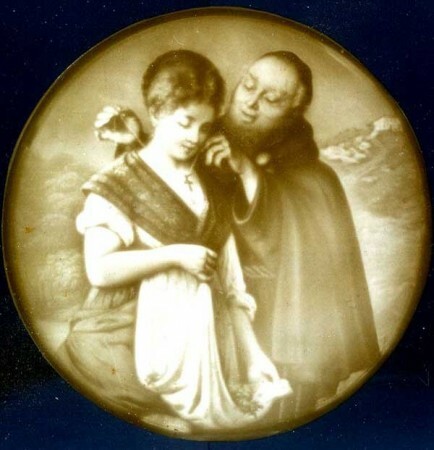 This is a very collectible lithophane (mostly found at the bottom of a rather plain porcelain stein.) To date I have no idea:  Who (and when) painted the original? Who the woman is ? Is that a halo around her head or her hat? What does the scene signify? And it may be this is the best answer ever on this question; as here’s another example also seen on a lithophane, this on a colored one . I guess I think it is a ‘cap’ of sorts. I really believe it to be the woman’s hair that has been braided and she has wrapped her braids around the back of her head. My grandmother wore her hair this way. It was a ‘fashion’ for women who never cut their hair usually for religious reasons but their hair was too heavy to hang down without causing discomfort. I believe after fashioning her braids around her head, she has covered them with a “snood”-type of hair covering. I probably won’t get any others agreeing with me, but I would bet a nickel I am correct. 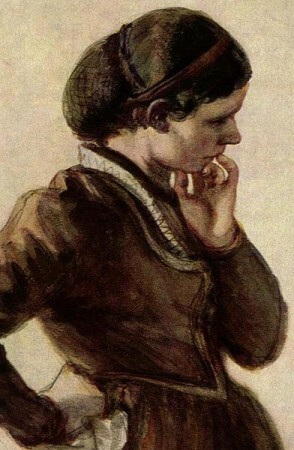 “Snood” is historically a type of European female headgear, or in modern times a tubular neck scarf. In the most common form the headgear resembles a close-fitting hood worn over the back of the head. A tighter-mesh band may cover the forehead or crown, then run behind the ears and under the nape of the neck. A sack of sorts dangles from this band, covering and containing the fall of long hair gathered at the back. A snood sometimes was made of solid fabric, but more often of loosely knitted yarn or other net-like material. Historically (and in some cultures still in use today) a small bag—netted, tatted, knitted, crocheted, or knotted (see macrame)—of fine thread, enclosed a bob of long hair on the back of the head or held it close to the nape. Modern hair nets, commonly in use where shed human hair may be undesirable, are often made of micro-fibre. In modern times the word also has come to be applied to a tubular neck protector or warmer, often worn by skiers or motorcyclists. 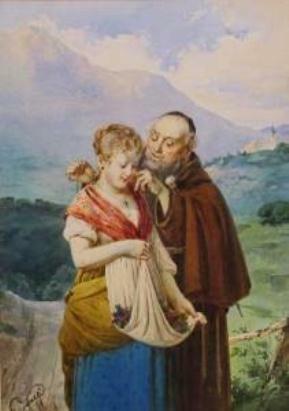 The garment may be worn either pulled down around the neck like a scarf, or pulled up over the hair and lower face, like a hood. Steve, See the attached link. I happen to own an artist original watercolor used for the lithophane. Provaggi was a conventional late19th Century Italian watercolorist. The male is a clergyman, the female has an apron full of vegetables in the full picture. It appears that the lithophane maker took some liberties with the original work. In the original the girl doesn’t have a “halo”, or a thin, by modern standards, more attractive face. Does anyone have an idea about the significance of this scene? = From below the hunters to the top of the flowers on the angel’s head. 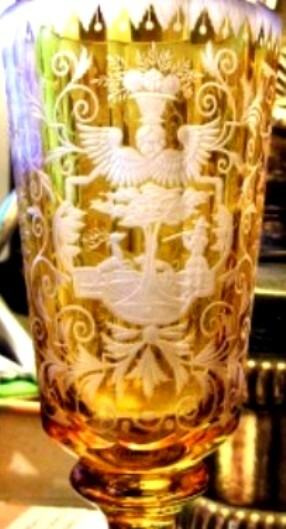 Found on a 8.5 inch tall, yellow stained Bohemian, cut-to-clear beaker. Circa 1860. 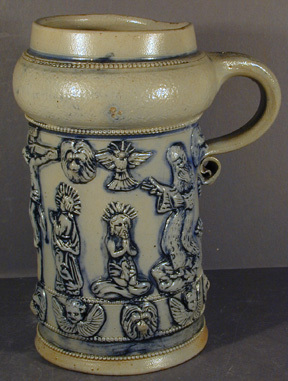 At about what year did the color “orange-ish tan” appear on both the top rim, and the bottom base rim on most pottery relief beer steins? Why did the German makers do that? This has continued to this day; why? Regenburger probably.May be a Westerwald? By Gerz, in the Westerwald. 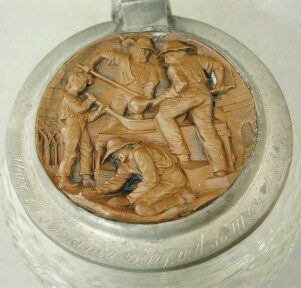 This “bronzed” (not bronze) lid is on a hobnail stein. Circa 1860 -70. What is the occupation shown? And why is one man on his knees on the floor? How many of these does one think were made before someone realized there were only 11 stripes shown on our flag? 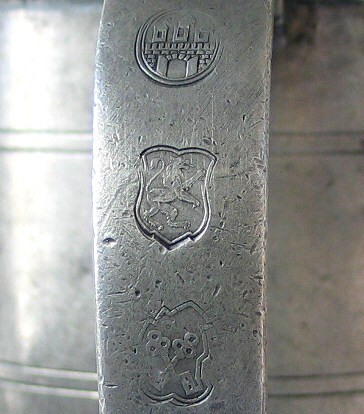 They do shown 45 stars, which makes the stein made somewhere between January 1896 (Utah) and October 1907 (Oklahoma), assuming the dumb shits had counted them from a model! Any of my readers have, or seen a corrected copy ? Note that the real flag alternates between 8 & 7 stars / row, whereas the stein flag has 9 across on ea. row. The real flag is 6 stars down – the flag on the stein is only 5 down, with the 9 across = 45. 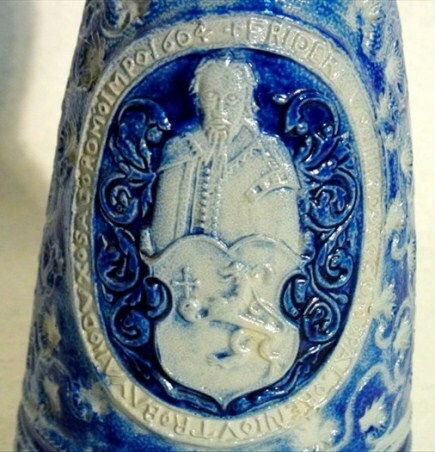 It also looks like the artist used a common nail for the flag-staff model on the stein. I went through the unanswered question part today, and I can certainly answer the question 9 about the peg at the side of pewter mugs. 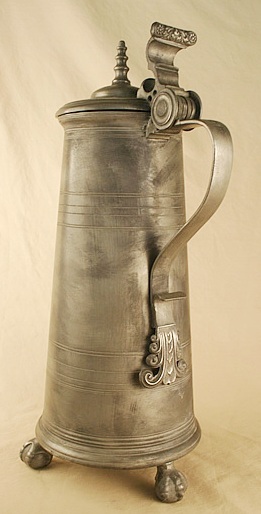 These are typical for southern German and Austrian pewter vessels, and they are indeed marks for measuring. You can imagine, that somebody paying for a drink in a tavern or sending his kid to the neighbourhood brewery wanted his money’s worth. 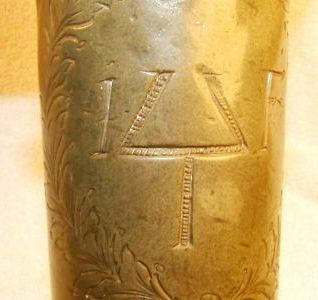 So most drinking vessels had this peg added by the pewtersmith to indicate the right measure. Contrary to the modern “Mass” (Mass = measure) of beer at the Oktoberfest which today is one liter, the old Bavarian “mass” was about 1.1 liters, it was abolished in the mid 19th century when all German measures where changed to the metric system. You can actually test it, most vessels will hold one “mass”, 1.1 liters if you fill the up to the peg. 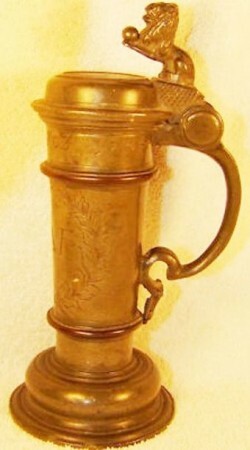 Larger or smaller vessels might also have 0.55, 1.65 or 2.2 liters, but it is always multiples of the old Bavarian “Mass”. And, of course, all modern beer glasses do have small indications on the side to show when the right measure of beer has been filled in. Many thanks to you Sir Weis! 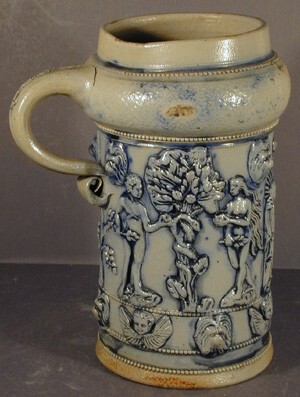 Okay, this is obviously an un-lidded” stein” (two liter in size) and not jut a mug / jug given the lidded ones in next two photos below. 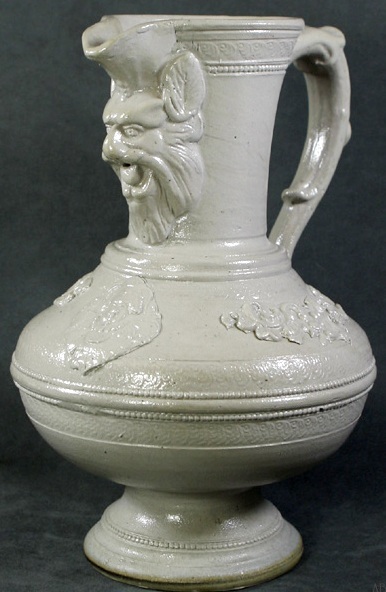 [FWTD] All three were made at Regensburg, Germany, by Fritz Thenn Co., 1877-1886, and not in the Westerwald. This is on a /18th liter kinder mug. While this figure is certainly ‘wild’, it is not the German “Wildman” and in fact several of us collectors have no idea who or what he represents. Some say he is being sacrificed. If so, why all the stoneware jars in front of him? Editor’s note, 5/24/13: I have one of these at home and finally got it out and studied it for a few minutes and soon figutred out this was a depiction of the Norse god Noki = Their God of fire! The key point which not shown on this photo are the side scenes with several of he Norse or Teutons warriers kneeling down to him.This along witht he Priestess with her arms outstretched towards him and him not havuing a halo (a Chritain attribute) but a star behind his head finallized it in my mind. 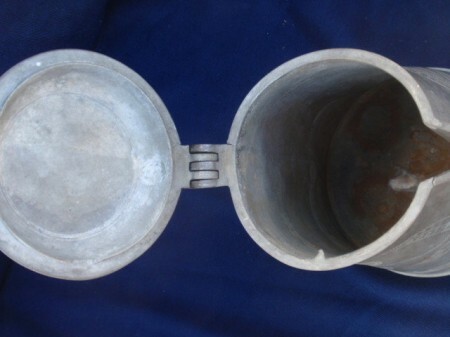 The pots are a clue as they need “firing” to become hard. 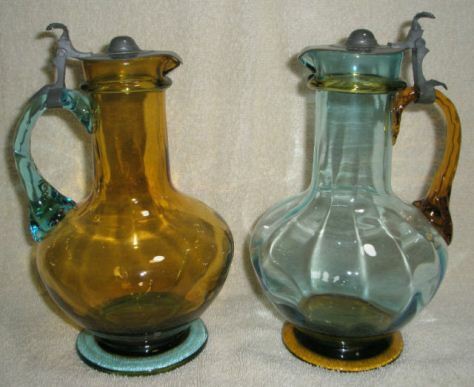 I don’t find these guys too attractive (especially with the flat tin lids), but I am curious: What glass firm made these? Who / what city / area made this beer server? What is that animal? Lion. panther ? I find it hard to believe that it is someone’s Lion! It looks more like a web footed salamander to me. Here below is a very close example of what now look more like a lion holding an orb. 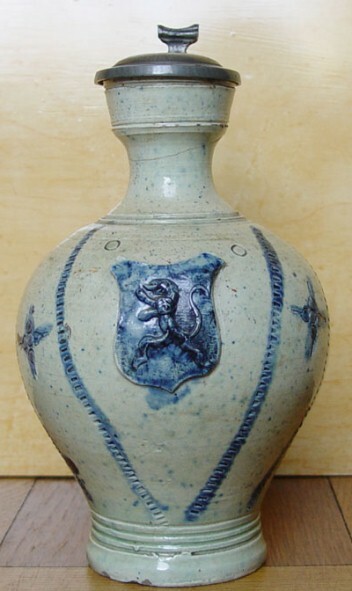 Also dubbed by seller as being on a Westerwald stein or server. Picture and the Coat of Arms of one of the Holy Roman Electors. 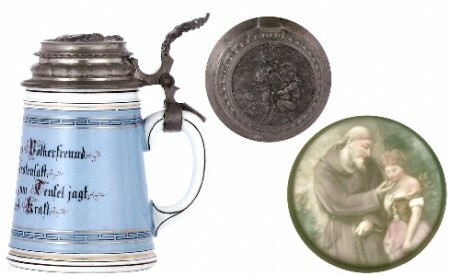 SEE THE ARTICLE: Guest writer’s articles  “Proskau Fayence Beer Steins,” by William Hamer. The answer was again supplied by Herr. Richard Weis in Munich. — This is Hercules. I and my readers thank you Mr. Weis. WHERE FROM AND HOW OLD? I now [2-2012]have reason to suspect that these three very similar piece are from Moravia (Austria-Hungary, just east to Bohemia) and I believe all date about Circa 1850 70 . 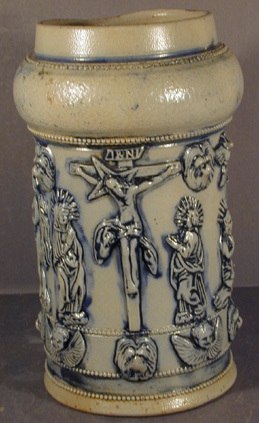 These pieces have previously be associated with Weygang by some stein auctioneers and sellers, but I never thought that. Too much wear and other indicators of real age. I just didn’t know where they were from, and am still not 100% positive. Any additional info will be certainly welcome. 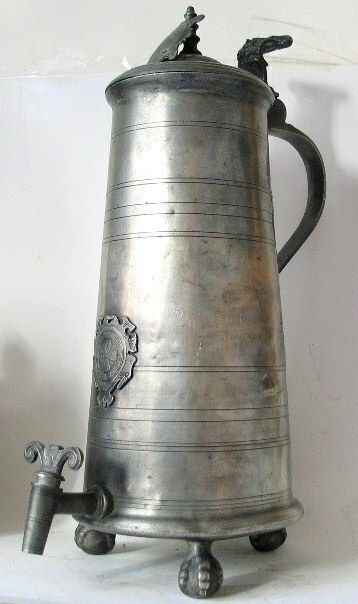 This massive beast, about 16 inches tall, could be ordered with or without the spout. The rear view and the marks. This one IS NOT a Weygang piece as far as I can determine. Again, this one is 100% NOT a Weygang piece.